Blaise has gone a week without her feeding pump. We haven't weighed her, but we have her 15 month well-baby check-up on Friday, so we'll see how she's doing then. We've begun the whole milk trials. So far so good. The nutritionist told us that, theoretically, Blaise has adequate intestine to tolerate regular milk. Then she paused, grinned a little and said, "Theoretically." We know what she meant. Short gut kids are total enigmas because none of them are enough alike to provide good, generalizable data. We're scientists; we get that. It's still a pain to not be able to make real predictions. But, so far, whole milk seems okay. Blaise has also rediscovered avocados and graham crackers and cheerios have surpassed peas as favorite foods. She has become much more daring in her standing/walking attempts. Still no long-term unsupported standing or walking, but she can go an awfully long way holding onto fingers. She also dances while sitting (holds her hands in front of her and twists at the waist; this is both super-cute and a *perfect* occupational therapy exercise). We got her a CD of New Orleans music and she figured out how to make her CD player play "Choo choo ch boogie" over and over. Really, less tech savvy in the toddler might be a good thing. The French Team (a.k.a., Mathieu, Julie and Little Erin) are arriving tomorrow afternoon. Blaise has only seen Little Erin on Skype but I have a feeling that they'll be fast friends. Can one city handle two such adorable girls? Only one way to find out. I'm not hooking Blaise up to her feeding pump tonight. In fact, she hasn't been hooked up since Friday. When the home medical supply company called this afternoon about next month's order, I didn't place one. We only get pump bags and formula from them, but we don't need more pump bags and we're using a different formula now. It's a big change and it feels a little strange. Don't get me wrong; it's great! But I keep feeling like I'm forgetting something and there's always the nagging worry that she won't eat enough and won't grow. Yes, I worry about that even when she's shoving 6 cheerios in her mouth at a time. It's hard to shake 15 months of worry about food and growth. Last week, we were telling someone the story of Blaise's first few months and we realized that it's been nearly a year since her second surgery and more than a year since the prescient fortune cookie. The progression since has been slow and steady and positive pretty much all the way. The tube is the last outward sign of all the craziness, giant scars notwithstanding. Now we have to learn to be parents of a more-or-less healthy kid. I'm reminded of the day we had to teach Ben to change a diaper on a baby *without* an ostomy. It's pretty easy by comparison. There are new pictures up at the photo site. So you can stop with the harassing phone calls. We live walking distance from at least 6 playgrounds. It's almost 70 degrees and sunny today. Those two facts make for one very happy Blaise (who has finally decided that bending her knees to step is worthwhile). We hear our friends and family in Kansas City are getting snow again today. So, yes, we are gloating. Blaise got this hippo push toy for Christmas that eats special blocks as you run it over them. She does not care about this feature, but prefers to put the blocks very carefully on top of other things. That's okay. She just realized that the activity table is a perfectly fine push toy, too. Clinic or "Oh, my goodness, Blaise!" We hit clinic today. It was a scheduled visit, which was nice. Blaise took a very long nap, so we were late, which was not great. Late for the doctor means going to the end of the line. We vroomed Blaise's toy car up and down the exam table many times. She was very patient. We saw our favorite NPs, our favorite GI doc and our favorite social worker. Then we went to see the vampires in outpatient blood draw (bad scene; Blaise cried so hard she made herself throw up). Finally, we went upstairs to see our 10East nurses. Between the swine flu panic and Blaise being generally healthy, we hadn't seen them in months. Almost all of our old regular nurses were on duty, which was fun. Lots of fussing over how big she is and how grown up she seems. Her weight is up to 17 lbs. 10 oz (8.0 kg) and she is 28 1/2 inches long. So still a beanpole, but a bigger beanpole and sticking to her growth curve, which is all we ask. We made the decision to switch her formula from Elecare to Pediasure. Pediasure has higher caloric density (30 kcal/oz), but is more widely available and isn't elemental. Blaise is going to have to start dealing with those complex proteins on her own. It's also milk-derived, so closer to real food. We've been cleared to begin introducing regular cow's milk as well. And then there's the really big change. Remember the g-tube? "Learn to love the g-tube?" "Enteral feeds encourage intestinal adaptation, so we'll be using the g-tube for a long time." "The g-tube is no big deal." We may be saying goodbye. We're going to try discontinuing her overnight tube feeds. This is the last step in getting rid of the tube. If she goes 3 months without tube feeds and is gaining weight appropriately, they'll remove her button. I'll believe it when I see it. And even then I might not believe it. It's a quiet night on Creighton St. Mission accomplished (for now). Erin's away giving a talk in the frozen north, which leaves me and the B on our own for 3 sleeps. Our friend Jenny taught us to count the days until something happens in those terms, and having a baby makes that particular unit of measure very concrete. I have to admit, I was a bit nervous about this. Erin's had to do several stretches like this while I've traveled this year and I had to make some trips while Blaise was still inpatient, too. This is the first time Erin's been anywhere without us along in...well, a while. We worked out that the last time Erin flew alone was a trip she took to England just under two years ago, and then we realized that Blaise was actually a stow-away on that trip. Sneaky, this one...very sneaky. Anyway, back to the nerves...definitely there at first, but having hung out together for two days, we're doing just fine. The weather in Boston is beautiful all of a sudden, so we've been strolling around town in our ultra-light umbrella stroller, hitting all the nicest toy stores and coffee shops, and we met our friend Margaret this morning for breakfast (eggs and bacon for me, "The Margaret" for Margaret (she made it up and Zoe's Diner respects her choices), and dry wheat toast for Blaise). In between all the walks, we've been having a lot of fun tearing up her room and putting it back together. Blaise has some ability to put Duplo blocks together now, and we also learned yesterday that her shoes squeak when you stomp in them. This is actually the best idea EVER for the parents of a child who are trying to coax their kid to do more stepping. Blaise thinks the squeaking is hilarious, and once she worked out that she could do it herself, bouncing and stomping became her new hobby. 1) The iPod "SimpleDraw" app is a great way to keep your 14-month old chilled out for a bit. 2) What's better than a playground ball? A BIG playground ball. 3) What's better than a BIG playground ball? Almost nothing. 4) Cheese is good, but Dad's cheese is much better. Tomorrow, Mom returns, but first Blaise and Dad head out for one last night on the town! I wish I could say we were done with travel for a while, but I suspect we're not quite done yet. At the very least, I'm headed to Baltimore in a few days to give a talk at ICIS (International Conference on Infant Studies) about some of my other-race research with 9-month olds. Besides that, we have to wait and see...me and/or Erin may have to make some more side trips to exotic locales to talk about our work. For now, the baby sleeps, the cat has stopped caterwauling, and it's time for a book. Blaise's Aunt Libby did a science fair project in junior high about which kinds of cheese mold fastest. She called it "Say Cheese!" (My junior high science fair projects were about causes and effects of ground water contamination; we're different people, me and Libby.) This has nothing to do with Blaise, but I always think of that project when I see the phrase "Say cheese." Anyway.... We abandoned the project of convincing Blaise to eat yogurt. She's not interested in being spoon-fed and we're not interested in cleaning yogurt off the walls, so we're calling a truce. Next on the dairy list: cheese. Cheese is nice and low in lactose, the sharper the better. Blaise wasn't sure at first, but she ate some. Today is day 4 of the cheese trial and so far so good on the gut front. She'd better continue to tolerate it because I just watched her completely scarf half an ounce or so of Vermont cheddar. Yes, okay, so it's been a while. Everything is fine on our end, but the reality is that an increasingly active toddler, plus two parents with demanding jobs, no child care to speak of and impending major career decisions leaves very little time for blogging. Blaise is 14 months old today and she celebrated by heading with Ben to the State House to protest inadequate funding (and consequent proposed changes in eligibility and cost) for Early Intervention services. Turnout for this "stroller-in" was very good and, hopefully, will make an impression on the Governor and the Department of Public Health. Her first political rally. Awww. Other fun stuff included a visit from Grandpa Tom over the weekend, complete with a trip to the aquarium and an afternoon at the local pub watching the USA/Canada hockey game. Blaise really liked the fish. She also weathered some rowdy hockey cheering very well. Grandpa sneaking her some French fries probably helped with the hockey fans. We've started to introduce dairy foods. Yogurt is first on the list (very low lactose, which short gut kids tend to have problems with), but Blaise doesn't like to be fed with a spoon. I tried smearing the yogurt on her toast this evening and she just wiped it all off. So it's hard to say whether her gut likes yogurt but Blaise certainly doesn't seem to. 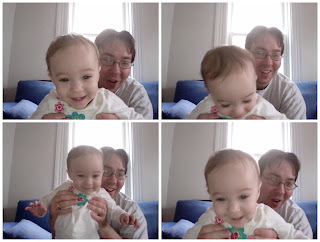 Developmentally, Blaise is becoming much more fluid through her knees, which is huge. Preemies tend to be somewhat hypertonic through their legs, which makes learning to stand and walk very tricky. We've been working really hard on getting her to bend and bear weight through her knees and it seems like she's finally having a breakthrough. She says a couple more words: "Doug" (one of her stuffed animals), "duck" and possibly "baby," although only Grandpa Tom has heard that one. I'm not sure there's a noun that's relevant to her interests that she doesn't understand. Also, putting diaper covers on Mama's head? Hilarious.